JESSICASMITHTV Success Story #1: Sherry G.
We’re so excited to begin sharing some of our community members’ success stories with you. This week we’re thrilled to share Sherry’s accomplishments — be sure to show her some love in the comments below! About Me: I live in the desert southwest of the U.S. I homeschool my 14 year old daughter, and do part time babysitting. I had gained weight after pregnancy and never lost it. In the past, I had tried Pilates and aerobics, but was confused by the moves. The treadmill was boring, and on one income I couldn’t afford the gym. An internet friend introduced me to workout dvd’s, and I started working out, and loved how it relieved stress, and my clothes became looser and I started toning up. Then I hit menopause and gained back the weight plus more. That’s when I knew I had to make a diet change too as well as probably visit a center like Advanced Gynecology of Alpharetta. I started using My Fitness Pal to track my eating and also incorporated more whole foods into my diet. At the same time, my husband had a work injury and was unemployed for a few months, and the stress was pretty high. Jessica’s workouts helped so much, and kept me sane with the stress relief of working out. My #JSTVFit Story: I had two dvd’s from one instructor, and was looking for more variety on the old Collage Video website. I found Jessica, and watched a clip from one of her workouts. I was so impressed with her professionalism and friendliness, I wanted to work out with her! Eventually, I joined her e-mail list and started doing the Challenges, then joined the FB Group. The accountability of checking in and the camaraderie with the members kept me consistent with my workouts. I’ve noticed toning with Jessica’s workouts, and I’ve never been in better shape! My clothes fit so much better. I’m also stronger and have better balance. At age 55, I don’t fear getting older anymore, as I know I can keep my mobility through working out. No matter what health challenges face me in the future, there is always a workout I can do! My Favorite #JSTVFit Workout: That’s a hard one, as I love so many. I love the Total Body Balance and Barre Fitness DVDs. And I love all of the You Tube workouts! I think the one I’ve used the most is the Terrifying Tabata Cardio. It’s such a great add on, and Peanut is so cute in her costumes! The best healthy living advice I can share is: Don’t focus on looks as a reason to change to a healthy lifestyle. It takes time to lose weight and tone up, and you won’t end up looking like a super model. It’s not enough to keep you motivated. Focus on how you feel with healthy lifestyle changes. Eating healthier and working out will give you more energy and you’ll feel better physically and mentally. Those changes are instantaneous and can keep you motivated to stick with it. Also, support also helps with accountability, whether friends or an online group. My most exciting results: I’ve lost two dress sizes. My balance is improved also. I noticed I could no longer roller skate with my daughter. But after working out with Jessica for about six months, I once again had the ability! I’ll never forget that feeling, when I noticed I could balance on those skates again! The first picture is from March 2013 when I first started working out with Jessica, and the second is from January 2014. I’m still the same size! Thank you Sherry. That was exactly what I needed to know. I belonged to Collage also but when I hit menopause none of my workout videos I purchased was helping. So reading your story really gave me some encouragement. Thank you! I’m glad it helped. I’m still working out with Jessica and enjoying it. Thanks for sharing Sherry. I am your before picture. ! I can’t wait to be your after! You look great! Great job, Sherry! Yours is a very inspiring story, and I can so relate because I’m about the same age as you are. ~Focus on how you feel with healthy lifestyle changes.~ Yes, I am right there with you. I am finally viewing the change in how I look as a bonus to how much better I feel! I imagine someday you skating with your daughter and her children! Sherry, it must be a fantastic feeling, being able to roller-skate with your daughter again! I’m not a mom yet, but I’m a daughter and (but you must already know this) it goes both ways: seeing our parents healthy and happy means the world to us. Taking good care of yourself like you’re doing is such a beautiful gift for your loved ones. And of course, the fact that you look great as an an added bonus doesn’t hurt ^_^! Bravo for your perseverance and for sharing with us how those efforts really do pay off eventually! Congrats on your great changes. I love to see the transformations along with the inspiring journey’s. Great advice too!! Thanks so much, Jessica! I appreciate you sharing my story. You’ve worked so hard and have given so much to us, and I’m very grateful. Thank you Maureen for the compliment. Yinka, I’m sure you will be sharing a success story one day too! 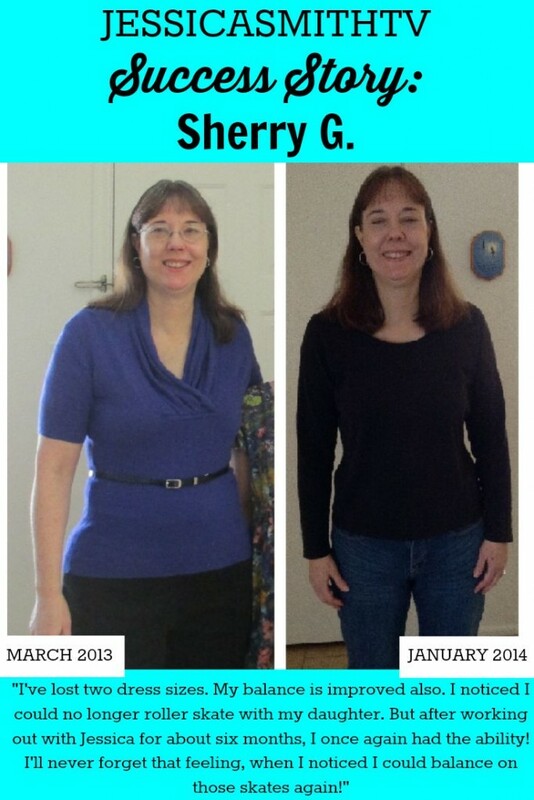 Congrats, Sherry, on your amazing progress. I love your motivation tips, too. I agree that losing weight for the sake of looks is not enough motivation. Outward appearance is for others (for the most part). I mean, if we all lived alone in a bubble, what difference would personal beauty make? Doing it for better daily living independence (strong enough to play with your daughter, for example) is an excellent goal! Thanks so much for sharing Sherry! I only started doing Jessica’s workouts three two weeks ago – just started on Week 3 of the #Fitin15 Challenge and I’m loving it. No big physical changes yet, but I feel so much better. My balance is improving and I sleep like I never have before. Maybe I’ll feel ready to submit my own story in a few months’ time. Sherry, you look amazing. Great job.